The Ducati MotoGP ‘salad box’ has been exposed but the Italian manufacturer remains tight-lipped on its exact contents and purpose. Almost a year on from its testing debut, the Ducati MotoGP ‘salad box’ has been exposed but the Italian manufacturer remains tight-lipped on its exact contents and purpose. 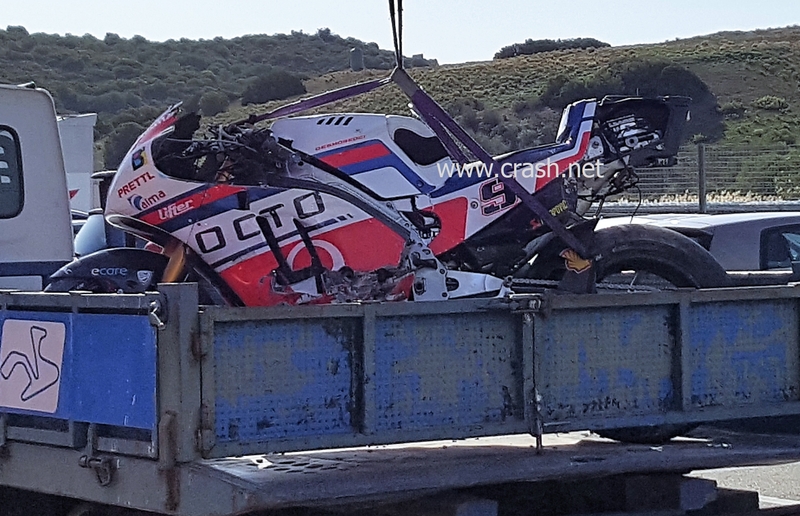 After Danilo Petrucci suffered a small crash during the final day of the Jerez test last month, the carbon-fibre casing was broken away to reveal a further metal box with electronics which hid its full secrets. Previous theories of its contents have ranged from an electronics storage system to a mass damper or gyroscope device. While the majority of onlookers agree the new Ducati’s handling has steadily improved this year it's not confirmed whether it is solely down to the ‘salad box’ – or even if it has an effect on the rider’s control of the bike – but rumours have been sent into overdrive about the device. Despite these clues the official word is no closer than when the device officially debut with Michele Pirro during the Sepang MotoGP pre-season test back in January. Keen eyes and technology heads at rival MotoGP teams will be eager to uncover the role the ‘salad box’ plays, so what do you think the device is and what’s its purpose? Let us know in the new Crash Forum section here.